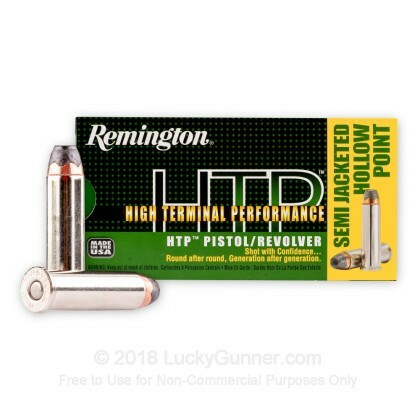 Remington's High Terminal Performance line of 357 Mag 158 gr Semi Jacketed Hollow Point ammunition is perfect for home defense with its massive energy transfer and expansion. Ballistic gelatin testing is one way to get an idea of how a self-defense load might perform in a real world self-defense situation. 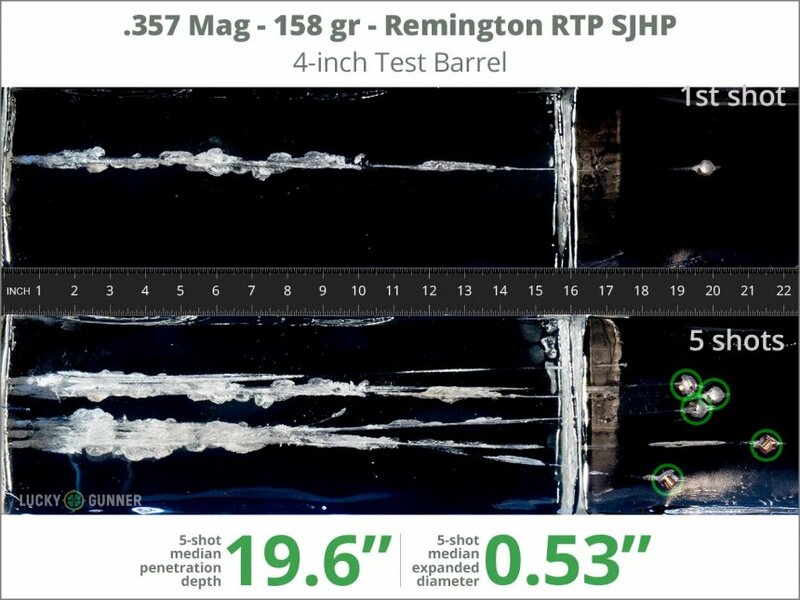 So we fired five rounds of Remington 158 gr Semi-Jacketed Hollow Point from a K6s from a distance of 10 feet into a block of synthetic ballistic gel with a barrier of four layers of fabric simulating heavy clothing. We then gathered information on the expansion and penetration characteristics of this load. That data is represented in the chart below. 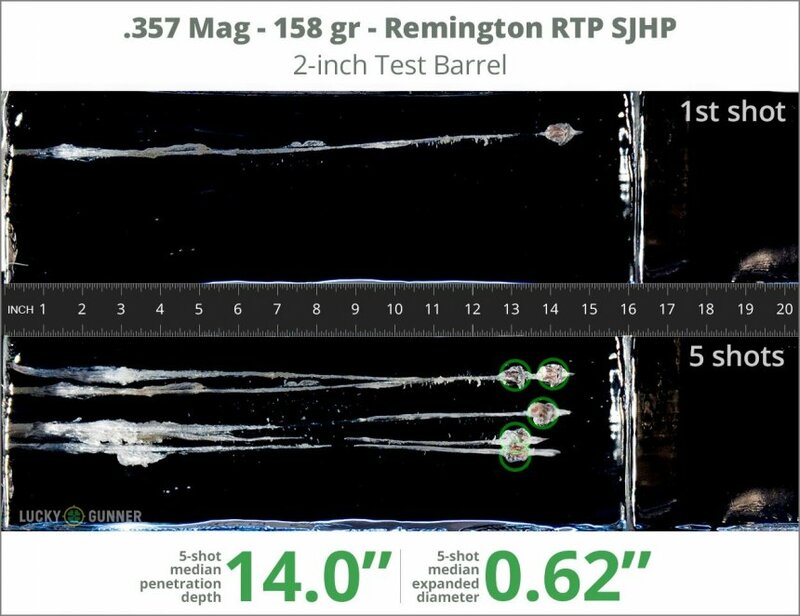 How this load compares to other .357 Magnum loads from our tests in regards to bullet expansion and penetration can be found in the diagrams at the bottom of the page. 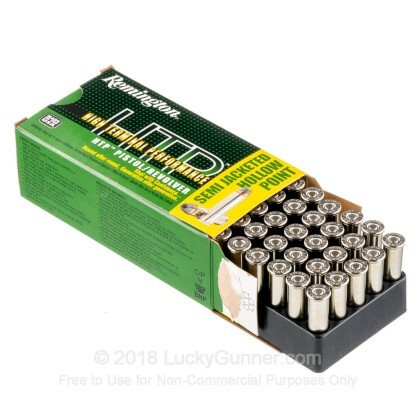 How do the results for this Remington .357 Magnum compare to other 357 Magnum Ammo? 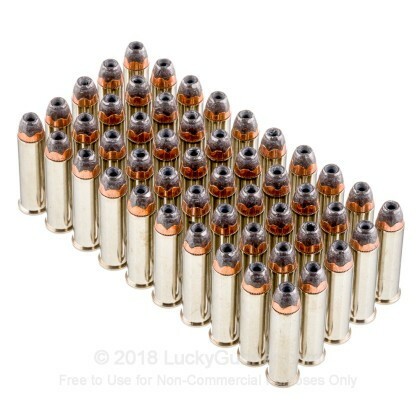 0.75" This ammo: 0.62" Min: 0.35" Median: 0.55" Max: 0.75"
14" 0" 9.2" 17.3" 41.7" This ammo: 14" Min: 9.2" Median: 17.3" Max: 41.7"
Ballistic gelatin testing is one way to get an idea of how a self-defense load might perform in a real world self-defense situation. So we fired five rounds of Remington 158 gr Semi-Jacketed Hollow Point from a GP100 from a distance of 10 feet into a block of synthetic ballistic gel with a barrier of four layers of fabric simulating heavy clothing. We then gathered information on the expansion and penetration characteristics of this load. That data is represented in the chart below. 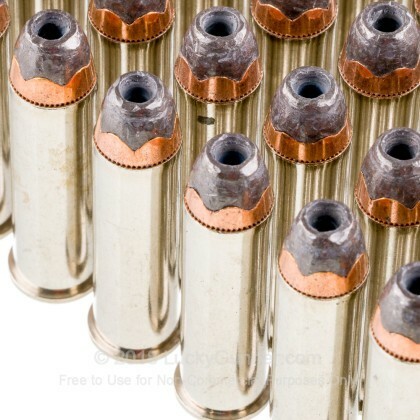 0.75" This ammo: 0.53" Min: 0.35" Median: 0.55" Max: 0.75"
19.6" 0" 9.2" 17.3" 41.7" This ammo: 19.6" Min: 9.2" Median: 17.3" Max: 41.7"
Instead of paying $50 for a box of 20 hollow points you can just buy these and use them for shooting and self-defense! I use to carry the 125gr version since my LEO days from the '70s through 2014. 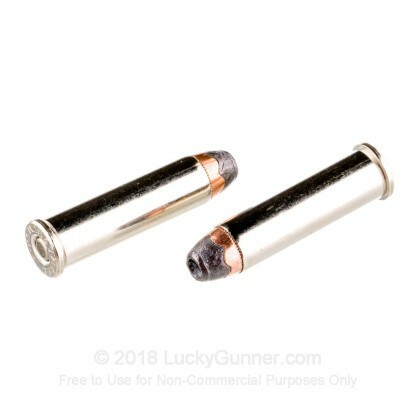 In my 2 1/2" S&W Model 19 the 158gr 357 magnum SJHP has better performance and easier to control. A: Hi Star. The 158gr hollow points will work very well for the smaller pigs. I personally prefer the soft points to insure penetration with any thick skin, heavily boned animal, but that is a personal choice. 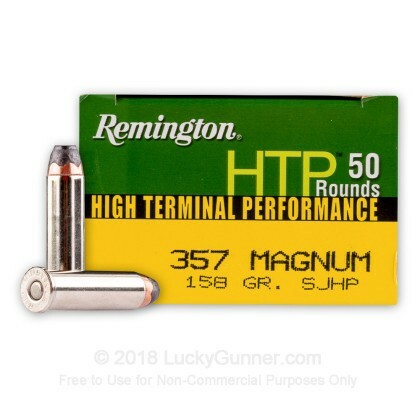 We also have this 357 Mag - 158 gr SJHP - Remington HTP - 500 Rounds ammo in stock in a bigger quantity.